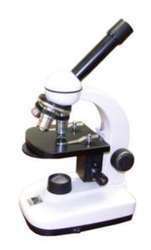 Student Compound Microscope are highly required in educational systems. To promote a better understanding and knowledge, we offer student compound microscope. 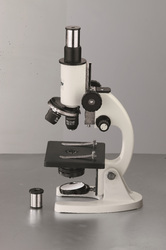 Microscopes can be availed in different sizes as per the requirements. We offer Student Compound Microscope that uses visible light and a system of lenses to magnify the images of small samples. The components of compound microscope include eyepiece, objective lenses, focus knobs, stage, nosepiece, condenser, light source and monocular cast body inclinable up to a certain horizontal position. It finds application in schools and colleges to teach the students about virus, bacteria and other topics. Body: Monocular solid cast body, inclinable upto a horizontal position (90Âo). Nose piece: Triple nose piece with positive click stops for precise and smooth alignment of objectives. Focusing: By coarse and fine focussing knobs. Illumination: Planoconcave mirror in adjustable fork mount appx 42mm. Looking for Student Compound Microscope ?